It’s always a happy occasion when I can combine two of my favorite subjects — food and baseball — into a single blog post. This March, my son and I had the privilege of being invited by my old and dear friend John to join him for a couple days of spring training in Arizona. For those unfamiliar with the sphere of professional baseball, the season begins in late March or early April. For a month or so before, the 30 Major League Baseball teams head to one of two locations for spring training and pre-season games — 15 go to Florida, 15 to Arizona. While several teams share their small spring training ballparks and facilities, there are still 10 such destinations around the greater Phoenix area, making it something of a springtime baseball mecca for fans. Among the 15 that go to Arizona are our Los Angeles Dodgers, and we were going to have the privilege of being guests at their training camp, Camelback Ranch, of the colorful legendary Dodger shortstop, Maury Wills. 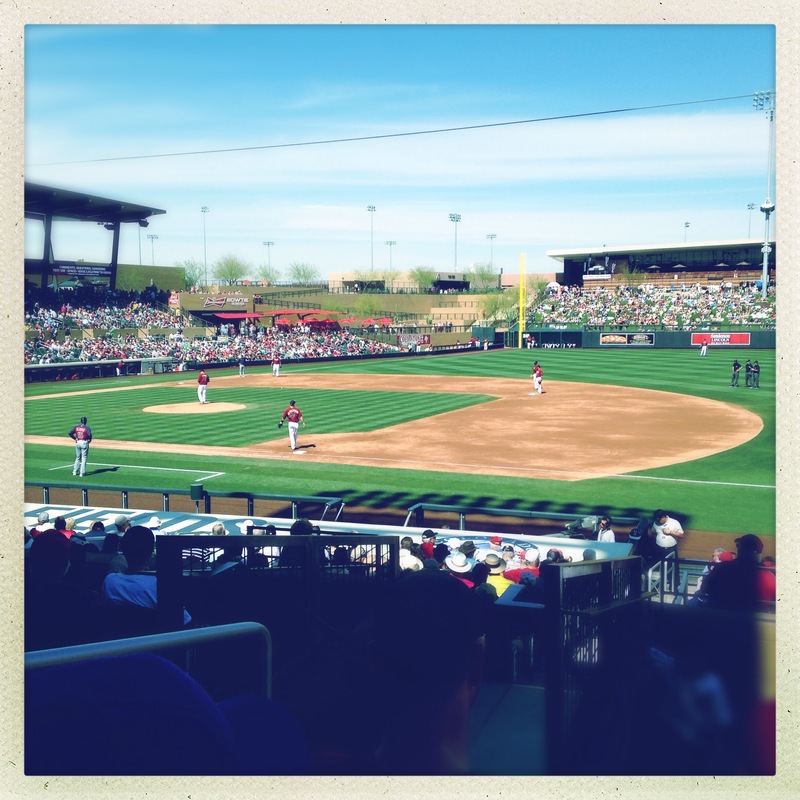 We hopped the short flight to Phoenix on Tuesday morning in time to catch the Arizona Diamondbacks playing the Cleveland Indians at the former’s Salt River Fields facility. 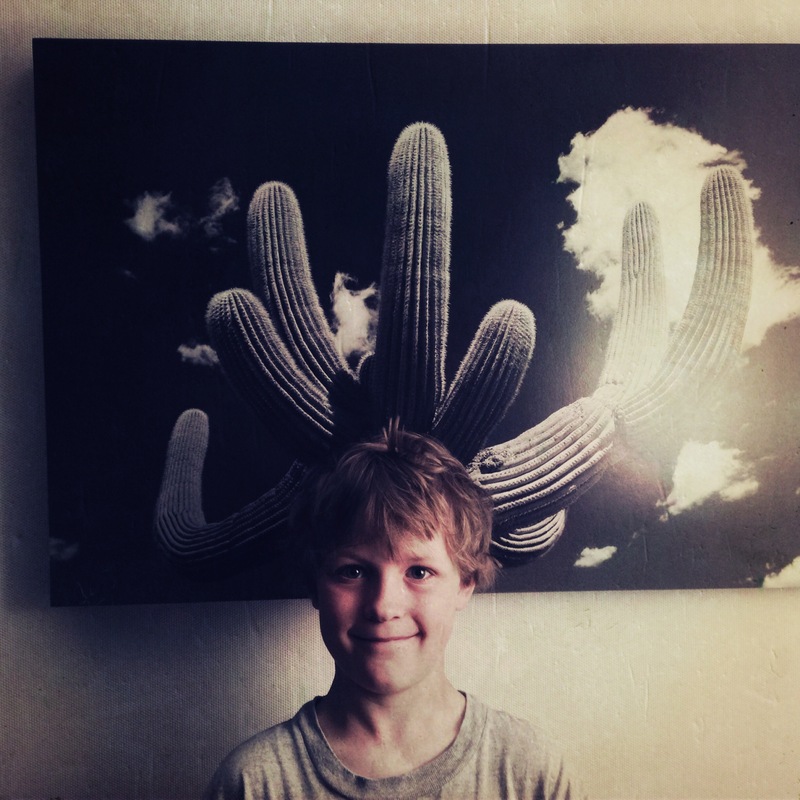 After the game, we checked into our hotel — The Saguaro, an old hotel in Old Town Scottsdale that had been given a Southwestern hip-ification upgrade. Nicole, my check in girl, handed me a 2-for-1 margarita coupon for their restaurant, Distrito. Flynn and I got settled in our room and then made for the restaurant, where the margaritas were tasty (don’t worry, I drank both) and the food a surprisingly creative take on Mexican. 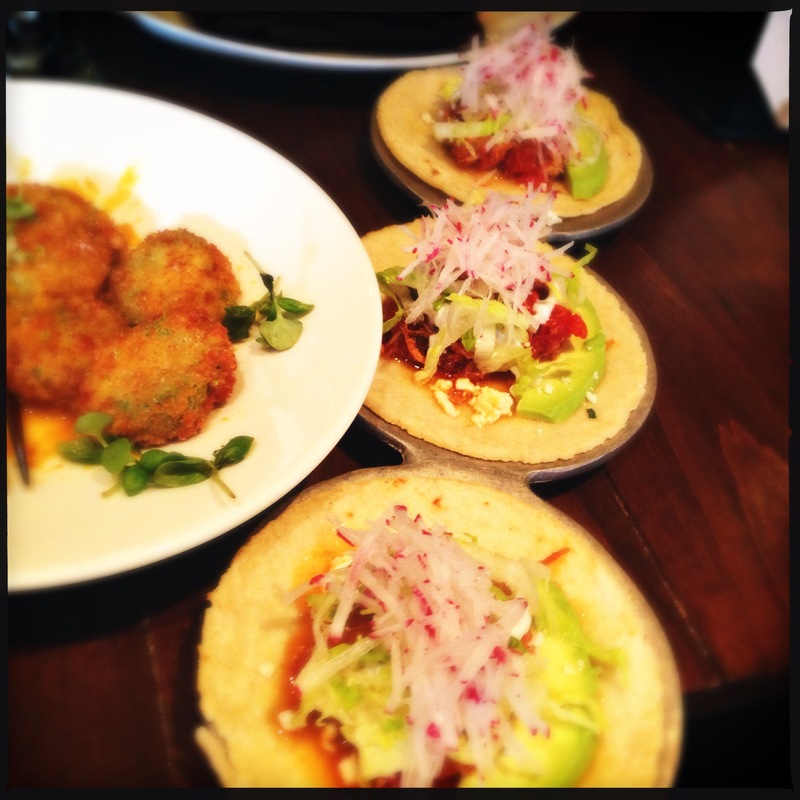 We sampled from the bar menu and enjoyed some antojitos appetizers — Flynn had chicken ropa vieja tacos with queso fresco, crema and radish, while I sampled the rellenitos: tiny stuffed Anaheim chiles with smoked tomato sofrito. In the morning after breakfast at Distrito with John, we headed for Camelback Ranch. The game was at 1 p.m., but we got there at 9 a.m. to enjoy time with Maury in “Maury’s Pit,” the mini-field where he ran his bunting drills. Maury was relaxing on a loungy looking chair with his friend, Gary, when we arrived. But he popped up to greet us, the stories began and never stopped. Although he would not attend the game with us and was in bed when John called him later in the afternoon, he was the spryest, most mischievous 82-year-old I’d ever met — and a man who’d helped lead the Dodgers to two World Series championships in the 1960s alongside Duke Snider, Sandy Koufax and Don Drysdale. Names which should mean something to even non-baseball fans. But Flynn was bored. 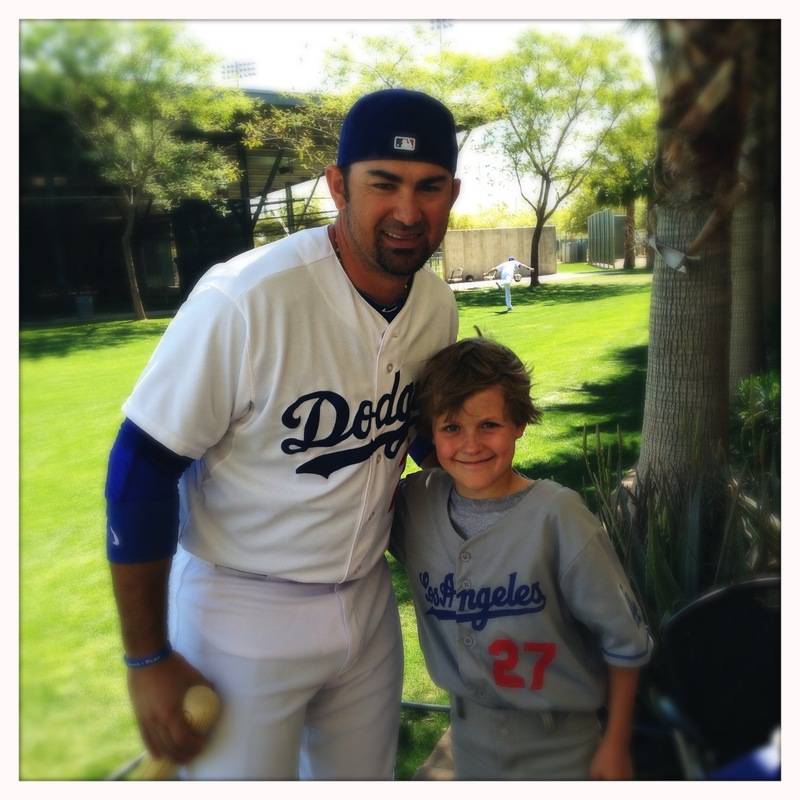 He wanted to meet today’s Dodgers — and at a wave of Maury’s hand, they came to meet him. Adrian Gonzalez, Andre Ethier, Matt Kemp… The team’s biggest star, pitcher Clayton Kershaw, went whizzing by on a joy ride in a golf cart, but we were unable to catch his attention, even with a wave from Maury. 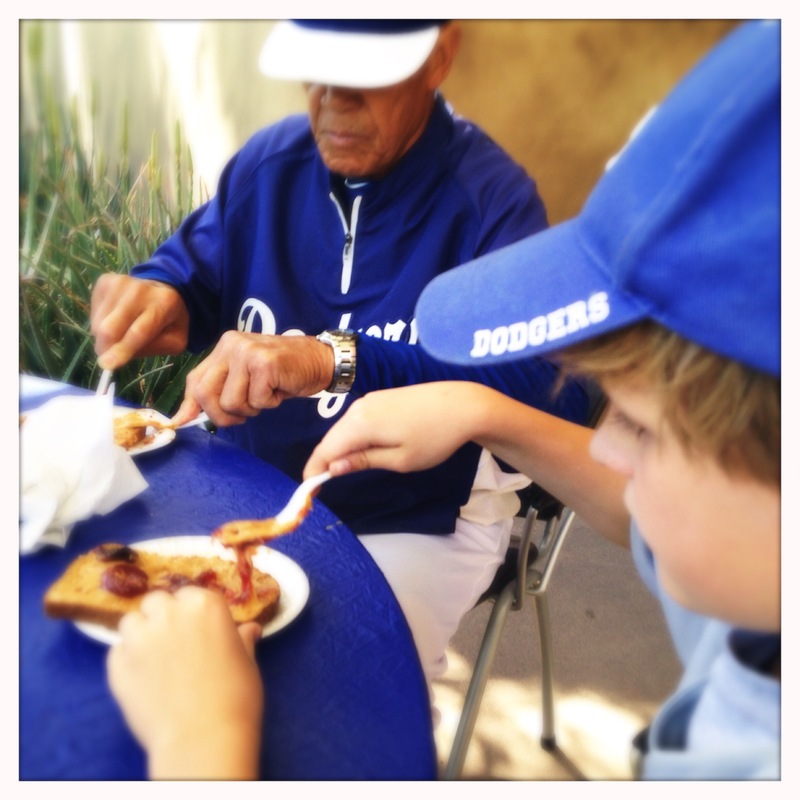 But by the end of the morning, after giving Flynn a private coaching session, making him an organic peanut butter and jelly sandwich (“I got a special treat for you, Flynn…” he said), and taking him on a whirlwind tour of the entire Camelback Ranch facility in Tommy Lasorda’s golf cart, Maury had won the kid over. “Who’s your favorite Dodger? ?” Maury said. And Flynn smiled and tapped the old man’s belly. Maury grabbed him in a big bear hug, and the boy’s smile got even bigger. After the morning, the game was somewhat anticlimactic — especially when, by the third inning, all the Dodger stars had been taken out to give the rookies a shot, and the team was losing by four or five runs. We left our seats to go get some Dodger Dogs, but on the way got distracted by a food cart selling my favorite kind of hot dog — the Chicago dog, a frank on a poppyseed bun with mustard, relish, pickles, tomato spears, hot peppers and celery salt. With a draft Longboard lager, it sounded like the perfect lunch. I ordered two, one for me and one for John (Flynn, a loyalist, had his heart set on a Dodger Dog), and handed the guy my credit card. He swiped it, and a moment later the receipt came squirting out. The vendor, a pleasant middle-aged Hispanic guy by name of Antonio, took one look at the receipt and flushed white. “I think I bought a hot dog for the whole stadium!” I replied. Soon, the issue was resolved, Antonio looked relieved and I enjoyed my hot dog. It was a good hot dog, maybe not $6,291 good. Although if the charge had to stand, it would’ve likely well been worth the extraordinary baseball lover’s dream day we’d had at Camelback Ranch. That is an amazing story in so many ways! I’m so glad you guys had a great time! Scottsdale is my home and I love it. Let me tell you a couple things to see the next time you are there if you want. I can’t wait to live there again. Dallas is not my thing…..Your ADORING SISTER WAITING FOR PAINTING! In the bottom picture – Nice crown, Flynn!! Great story. Must have been a delicious hotdog! I think it had fois gras in the middle and the relish was made of real gold leaf! Best baseball story of the year! Maury Wills!! How great is that? and a Chicago Dog!? That John is a great friend!! Baseball fantasy . . . Wish you’d been there, my friend! One who truly would’ve appreciated it.